We never get tired of saying that at Motordepot we try and do things the a little differently, ensuring the cars we sell are the best quality available and at the most competitive price. We also never tire of saying we expect our customers to be treated fairly, in a relaxed, open and transparent manner, but let's be honest we can repeat this until we're blue in the face, what really matters is what our customers experience in reality. 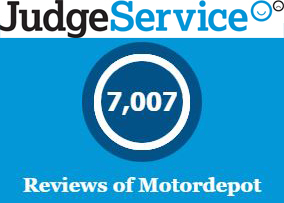 In a little over a year since we have been using JudgeService we have been overwhelmed by the number of reviews we have had, at the last count we had a massive 7,007 that's a rate of almost 20 new reviews or testimonials per day! The scores are mighty impressive too, the overall satisfaction of customers is 95% compared to the industry average on Judge Service of 90.8% and when asked 99% of our customers would recommend us to friends and family...and to the 1% who may not, we're listening to you and continuing to improve our service to help us be as good as we possibly can be. Even the 1 star review was a good one!...we think the one star was clicked in error! Thank you to everyone who has taken the time to leave us a review, we hope we can help you find a car the next you're looking!